A general view at Glossier Pop-Up Shop at Nasty Gal Santa Monica on June 4, 2015 in Santa Monica, California. In the race to offer full-spectrum beauty, smaller brands have often struggled to keep up, as larger brands seem to be pushing broader shade ranges into the market with stunning speed (sometimes, a little too fast). 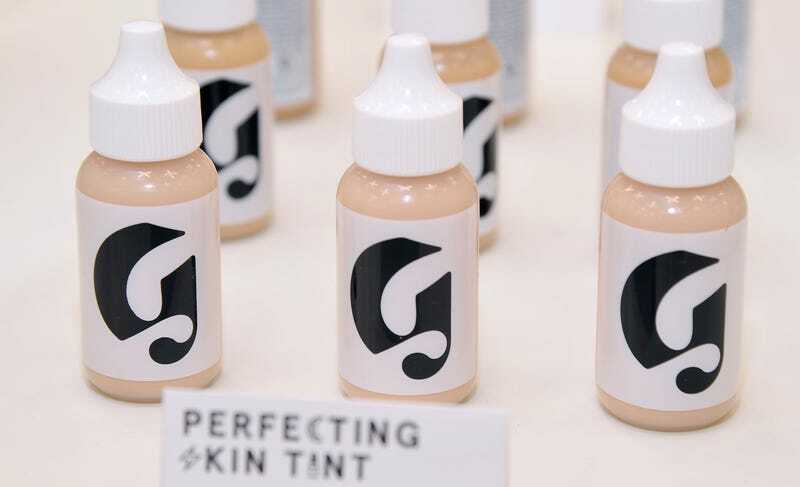 But as we know, slow and steady often wins the race, so we’re hoping for the best from the recent expansion of millennial cult favorite brand Glossier’s Perfecting Skin Tint. The five-year-old brand, which launched with only five shades of its Skin Tint (stopping at a deep caramel), later dropping an equally limited shade range in its Stretch Concealer, announced on Wednesday that it has now more than doubled its offerings. Makeup lovers seeking a sheer, “no-makeup” look now have 12 different shades to choose from in both products, and the brand’s “Wowder” is also upping its range from three shades to five. Also interesting? Instead of labeling the colors “light” to “dark,” the brand is employing a Shade Finder tool to help shoppers find their match in G1 to G12—and the deepest shade is G1. Why should we care that the brand is finally catching up? Because in the full-range foundation game Fenty Beauty kicked off with its unprecedented 40-shade launch in 2017 (now 50 shades), what’s been missing are lighter, luminescent formulations like Glossier’s. In fact, it’s a formulation so light and natural looking, 12 shades is actually a solid offering. We’re now excited for the possibilities once this polar vortex is a distant memory and we’re trying to stay gorgeous in the blazing summer heat. And while it’s easy to criticize Glossier’s founder, Emily Weiss, for not launching with a more inclusive range in 2014, we’re firm believers that when you know better, you do better. Clearly, Glossier is watching the market, and as Allure reports, listening to their critics. Unsurprisingly, the brand credits the launch to the feedback it got from women of color — most specifically, the concerns raised on Glossier Brown, an Instagram account created by blogger Devin McGhee with a mission to provide a platform and community for people of color. Last year, the account (which showcases the brand’s products on “brown-skinned beauties”) even got the attention of founder Emily Weiss. Women of color, black women specifically, spend more money than any other demographic on cosmetics. I believe this is mainly because we are constantly having to purchase multiple shades and mix our own to find a match. It can be discouraging and slightly taxing on our pockets. But until there are more women of color in leadership positions at beauty companies, it will continue to affect what is or is not produced for us. If women of color are not amongst the people included in the conversations at the top, it will always show, as it directly affects who is fighting for diversity and inclusion within the beauty industry. Beautyblender Just Added 8 New Shades to Fix Its Foundation Fail—But Is It Good Enough?